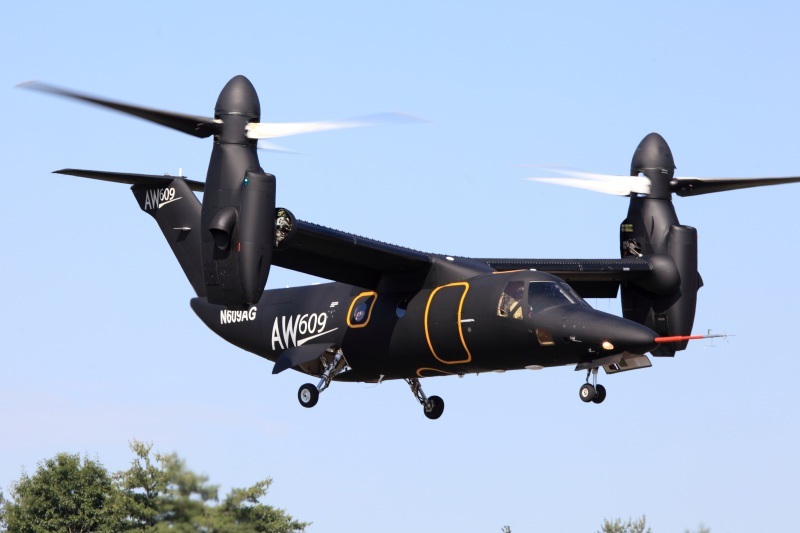 PARIS --- The surprise sale of three AW609 tiltrotor to the United Arab Emirates military is an unexpected marketing coup for the Italian manufacturer, and opens a large new market for an aircraft that until now has been mostly considered suitable for high-speed executive transport. The same capabilities that allow the AW609 to fly executives at high speed from Milan to Yeovil – vertical take-off and landing, high speed, long range -- also make it well-suited to search and rescue missions. Furthermore, the relatively small size of its rotors means it will prove less dangerous to rescuees than the much larger Bell-Boeing V-22 Osprey tiltrotor, which the United Arab Emirates had initially looked at in 2012 to meet the same requirement. When in the hover, the V-22’s large rotors (each has a diameter of 11.6 meters, and a disc area of 212 sq. m.) generate a very strong downwash that is dangerous to the person being rescued, especially if floating in the water, and can also impede hoist operations, both when lowering rescuemen and when recovering victims. By comparison, the AW609’s rotors have a diameter of 7.9 meters and a disc area of 91 sq. m. so the downwash is much weaker, and much less likely to disrupt hoist operations. The AW609 also avoids another major drawback of the V-22: the super-hot exhaust of its turboshafts, each rated at 6,100 shp, which can cause injuries. In fact, the US Navy has had to use metal plates to protect the surface of its carrier flight decks when V-22s idle before and after take-off, as the exhausts are so hot that flight decks melted after a couple of minutes. By comparison, the AW609’s two turboshaft engines develop 1,940 shp each – one third the power of the V-22’s – so their exhaust temperature is nowhere near as dangerous. The only obvious difficulty in operating the AW609 on search and rescue missions is finding where to house the rescue hoist, and how to deploy it. Other issues are whether the relatively narrow (1.57 meters) and low (1.42 meters) cabin can accommodate the hoist operator and rescue technicians, and whether the door is wide enough to allow access to two men being hoisted together, or to a stretcher or rescue bucket. In any case, the fuselage will require reinforcement to extend the hoist for rescue and retract it during transit flights, while given the small cabin space available hoist operations will require specific procedures and special training. The Joint Aviation Command currently uses AW139s for SAR missions. Compared to this conventional helicopter, the AW609 requires roughly one-fourth more power (2x1,940 shp compared to 2x 1,531 shp for the AW139) to carry one-third the payload, but for SAR this is of little consequence as the speed / range performance matters more than cost / effectiveness or specific operating costs. In any case, by agreeing to become the launch customer for the search and rescue variant of the AW609 TiltRotor, the UAE’s Joint Aviation Command doesn’t appear to expect any serious complications. AW’s Nov. 10 announcement of the sale notes the SAR configuration “will include a tailored equipment configuration to meet its specific operational requirements,” but since deliveries are to begin “in the 2019 timeframe” there is ample time to adapt the existing design. 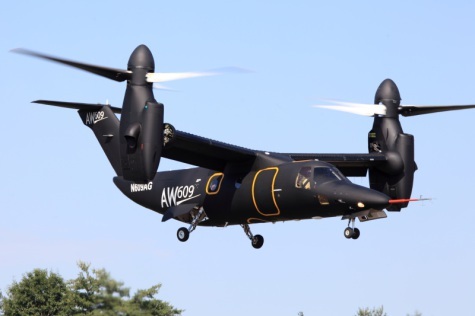 The Joint Aviation Command said "The AW609's unique speed and range characteristics, combined with its ability to hover, will dramatically increase SAR mission capabilities of the UAE's Joint Aviation Command. We look forward to operating the AW609 TiltRotor and utilizing the speed advantage it brings." The JAC has ordered three AW609s with options for three more. The Joint Aviation Command will further expand its operational capabilities leveraging on the 275 knot maximum speed and 750 nm range of the AW609 TiltRotor. With approximately twice the speed and twice the range of a helicopter the AW609 can dramatically reduce the time it takes to reach a rescue scene, AW’s statement concluded.